I clocked out of work a few weeks ago and briskly walked to Neiman's determined to get my hands on a bottle of the Christian Louboutin nail polish that everyone has been raving about -- but the product itself hasn't really been the talk of the web. Everyone has been so fixed on the price ($50.00), yet it has been sold out at Nordstrom, Sephora, and Neiman Marcus since its pre-order (it has since been replenished). As I mentioned in my first blog post about the latest addition to the Louboutin brand, I'm not very surprised by the price. I mean, it's Christian Louboutin. Did you seriously expect less? Honestly, I've spent more on the latest and greatest beauty products so the price of the product didn't bother me. I would be lying if I said that we were'nt paying for the prestigious designer name -- we most certainly are. However, this bottle of red nail polish (that is probably dead-on in similarity to dozens of other red lacquers) represents so much more to me than simply a perfect glossy manicure. I see this product as a collector's item. The bottle itself is a piece of art and there is a story/meaning behind its existence. Plus, it will look fabulous in my new apartment. Before I purchased my bottle, I read a lot of reviews (most of which were written by women who had yet to purchase the product) ranting about the price and some criticizing those who chose to splurge on it. How one person may view this product may not be the same as another. To each his own. Now, on to the review...is it worth it? For months, the only thing we knew about this product was what the packaging looked like -- a multi-faceted bottle inspired by 18th century European architecture with a top the height of Louboutin's tallest Ballerina Ultima heel. The bottle comes in a shiny black and red box engraved with the Christian Louboutin signature logo. There is an opening at the top of the box to accommodate the tall brush handle. Polish comes in a multi-faceted black gradient glass bottle. Christian Louboutin's Ballerina Ultima heel is said to be approximately 8 inches tall. I don't own any Loubies right now, but I wanted you to see the height of the bottle compared to the height of a normal pair of platform heels (it's slightly taller by a few centimeters). There's nothing worse than struggling to apply nail polish with your non-dominant hand with a super short bottle top. I noticed that I didn't have as tough of a time applying the lacquer with my left hand because I had more of a top to hold onto for a steady application. Also, the brush has shorter bristles that help get a more smooth, bubble-free coat. I didn't have any problems with the brush collecting too much product, so I really appreciated that. The brush is actually very easy to use, especially if you're using your non-dominant hand -- to me, it's similar to a calligraphy pen and ink. The first color in the collection of Louboutin nail lacquers is 'Rouge Louboutin' -- the iconic red we all know and love. After I applied the first coat, I realized that a second coat could be applied but the color was so vivid and opaque that I didn't have to. The description in the product description describes a "highly pigmented and rich formula" and the product lives up to that. Although, I always apply at least two coats regardless. Update: I was in such a rush to try the polish that I originally did not apply a base or top coat, and that makes all the difference in the application and longevity! The second time I applied the lacquer, I used 'I Wore It Better' byTrust Fund Beauty as a base coat and the Butter London Hardwear Top Coat to maintain the glossy finish. With two coats of my "base", I only needed one coat of the 'Rouge Louboutin' which is great because for $50/bottle, every coat applied is too precious to waste. To be honest, if you're not up for splurging, you could probably find a similar red from a drugstore and do just fine with a more inexpensive Louboutin-like manicure. This is after application with a base coat, two coats of Rouge Louboutin, and a top coat. Beautiful pigmentation even only with one coat! Obviously my biggest mistake the first time I applied the nail polish was forgetting base/top coats, so it didn't really last very long. The base coat helped lessen the number of coats I had to use and the top coat really sealed in the color and maintained the patent leather-like gloss. Although, my manicure was heavily chipped the first time, I will say that the polish was less messy when I peeled and picked it off. With acetone nail polish remover, it left my nails stained just as many highly pigmented polishes do. Like most nail polishes these days, the Christian Louboutin nail lacquers are three-free formulas. There are currently 22 more colors schedule for release at the end of August or beginning of September. Now that I've had a few weeks to use the Christian Louboutin 'Rouge Louboutin' nail lacquer, I will say that it is a great product. It works the way a nail polish is supposed to. This is definitely much higher quality than a drugstore brand of polish; however, this is not exactly a miracle nail polish, so don't expect that either! The high price tag is mainly for the designer name, in my opinion -- that's pretty understandable seeing that Louboutin shoes typically start at $650 USD. But as someone who is very into the ins-and-outs of the merchandising industry, I think that a similar red could be found at about the same quality from Butter London (Come To Bed) or Deborah Lippmann (My Old Flame). I give this product an A- because it was an excellent product, but the high price tag will definitely hinder me from replenishing very often or at all. 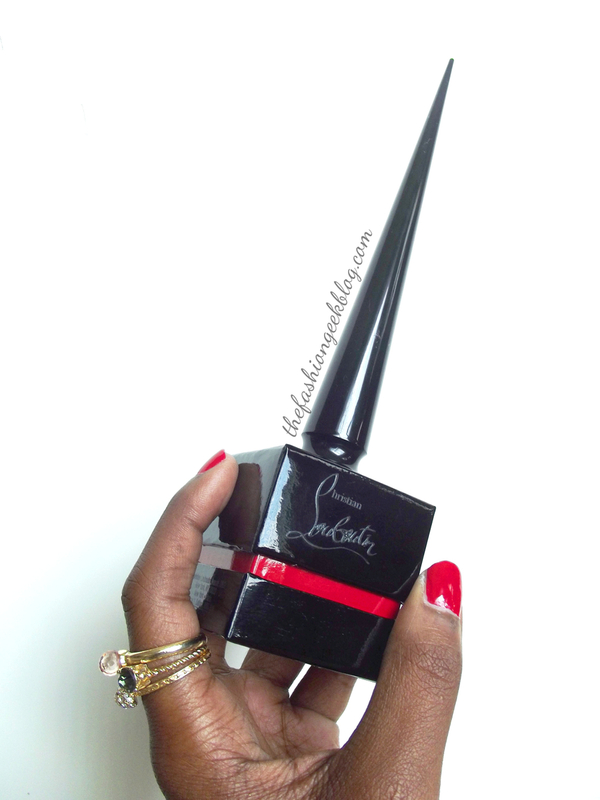 Here's a closer look at the 'Rouge Louboutin' nail polish. The Fashion Geek is back!